Ive seen this issue before and reported it, but couldnt fully verify, now i have. If i delete this from the address book and re-add it via the add connection and internet ID looking at the same private server with the correct password, it then works as it should. Thank you for your report. I will forward this issue to our developers and ask for their input on the matter. Perhaps, we'll need some logs or even remote session to see why it's happening. And, of course, we need the Host logs :) Could you please email those to support@. Thanks! That host has been restarted a few times, will that matter? Yes, received. We will examine the logs and get back to you either via email or here on the forum. Regarding Host restarts, it's unlikely it could affect the issue. In the dialog, on the Connection tab select "Internet ID". Do not enter any ID here, it is supposed to take different values automatically. Click Change and specify your Internet ID server. 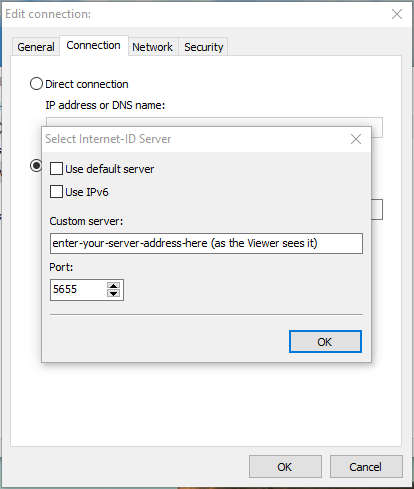 Note that your Server IP address (or DNS name, whatever you use) should be accessible by the Viewer. And by the way, we have released version 6.5.0.8 with the "status notification bug" fixed as well as a few minor issues with the server. So if you upgrade - upgrade them all. 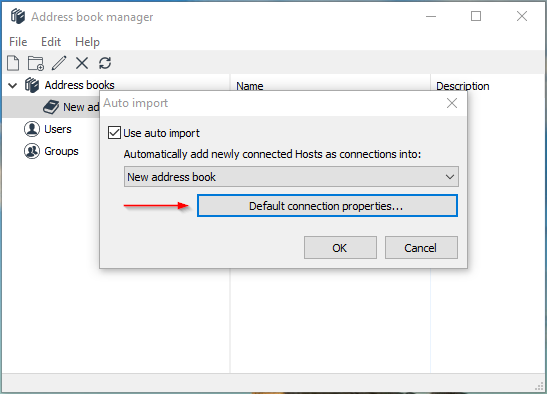 The server address book does the "auto import" puts new connections in a group (which works). There is no default password, however as i said when i change the password on the already added address book entry it doesn't fix the issue, only deleting and re-adding. Could this be a connection name issue? If the default name is empty, the computer name it taken. If the field is populated its value is added a prefix to computername. The password field you can see in connection properties in the Viewer is just for convenience, i.e. to auto-fill the password prompt and let you connect to the Host without entering the password to save time. The actual password is set on the Host (Right click Host icon -> Settings for Host -> Security). In order to successfully connect to the Host you must specify this password in your Viewer, regardless how exactly you do that - manually on password prompt, or pre-fill in the connection properties. 1. You set custom connection properties in the "Auto-import" feature settings on the Server (the default properties button). 2. The server automatically adds (imports) a new Host into your address book. 3. When you check the connection properties of the newly added connection you cannot find your custom-set properties.